Salt Lakers have the opportunity to try delicious food from some of the best Salt Lake restaurants for about 50% off regular menu price, without the need of coupons. 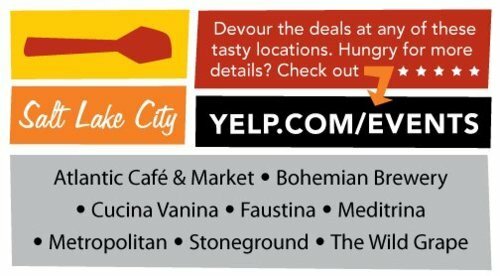 From July 11th through the 17th stop by any participating restaurant and you’ll be given a special “Yelp Eats” menu with deeply discounted meals. And these aren’t deals at Bob’s Burger Shak. We’re talking Atlantic Café, Bohemian Brewery, Cucina Vanina, Faustina, Meditrina, Metropolitan, Stoneground, and The Wild Grape. If you haven’t tried these restaurants, now’s your chance for minimal cash. I’ll be out the door (excluding tip of course) for $22! For more information on Yelp Eats, go here.